You've probably seen the meme that's been going around for a couple years, generally some variation on a particular idea: This generation was raised on Harry Potter and The Hunger Games, of course they're not going to stand for Trump's authoritarianism. Whatever the generational political demography may be, there is a problem with this claim. The politics of The Hunger Games (and Harry Potter, and others that I have little knowledge of) are almost studiously ambivalent on political issues. In The Hunger Games, any political perspective beside outright totalitarianism can be projected onto Katniss and her compatriots. The world of Panem is one in which the wealthy exploit the labor of the poor by demanding unwavering patriotism and convincing oppressed peoples to distrust each other. They demand cultural and ethnic homogeneity. A reluctant hero becomes a symbol of a resistance movement, aiming to convince the population to overthrow the ruling class and establish a more equitable society, though it turns out the leader of the resistance is just as bad as the old leader. Also... The world of Panem is one in which a centralized state power enslaves rural populations by disarming them. They demand that everyone work without hope of personal advancement. A reluctant hero becomes a symbol of a militia aiming to overthrow tyranny and establish a fair society, though it turns out the leader of the militia is just as bad as the old leader. Both of these descriptions are perfectly accurate. What's more, the coding in the books and films are just as ambiguous. The denizens of the capital dress in a fashion reminiscent of European aristocracy and adopt the gilded age's condescending attitude towards the poor. (So it's a class issue! Get the guillotines! ¡Viva la revolución!) At the same time, they're effete urban elites who control the media. (See, it's a government issue! Can't let them gubmint bastards boss us around!) Katniss herself (See! A female protagonist! #Resist) is ambivalent (See! She just wants to protect her family, as any good woman would! #FamilyValues) about the political aspect of her role as spokesperson of a resistance movement, and ends up more or less opting out of having any role in the development of a new society. This is generally true of Harry Potter as well, though we tend to forget that given J. K. Rowling's frequent political statements. Harry Potter is more explicit politically, the parallels between the Death Eaters and Nazis being so evident that denying them is downright silly, but, as strange as it is for me to have to type this, outright denouncement of Naziism was less politically controversial ten years ago than it is today. A running gag in video game communities of the time held that there were five types of enemies you could kill without any controversy or guilt: Aliens, Robots, Zombies, Terrorists, and Nazis. Only moral reprobates (of which there are disconcertingly many) wouldn't side with Harry and his pals. Still, it is only the outright Nazi beliefs of the Death Eaters that qualify one as a villain in this series. To be clear, I'm not trying to criticize YA series, but rather point out that most of the political content we see in them is projected. I really don't want to get into a long screed about the efficacy of counter-hegemony so I'll just end the post here. 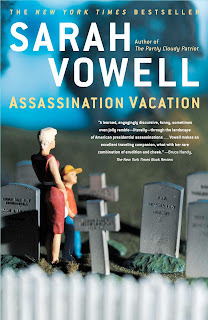 Sarah Vowell's Assassination Vacation (2005) is part pop-history and part travelogue. Vowell sets off to visit the places associated with the Lincoln, Garfield, and McKinley assassinations, from Ford's Theater to the Mütter Museum in Philadelphia, where you can see a piece of Charles Guiteau's brain floating in a jar. Vowell argues that the almost obsessive devotion to maintaining and visiting these sites is like a secular version of Catholic pilgrimages, that the shards of Lincoln's brain or the ominously vague "Piece of John Wilkes Booth," serve a similar function to the relics of saints. Overall, I recommend the book, as a good introduction to the aforementioned assassinations in general, and for a wealth of detail on the tangential or minor figures attached to the event. But I have some thoughts of my own regarding her claim about the relic-like nature of the artifacts of assassination, at least regarding the assassin. While the fallen leaders and their belongings may possess the qualities of relics, we still have to wonder why there is such a draw towards the killers. With maybe the exception of Pontius Pilate, there isn't much lasting interest in individuals who kill holy figures. And yet, Charles Guiteau is nearly as famous as President Garfield, and most Americans can name only one 19th century actor: John Wilkes Booth. What makes these men so alluring, not ideologically or morally, but nevertheless drawing our attention? Why do I know more about Leon Czolgosz than every member of McKinley's cabinet? The power of religious relics lies in their connection to the divine, while historical relics draw their power through their connection to History. Even if we know this to be ontologically untrue, we can't help but feel that an object's proximity to some great historical moment or personage imbues that object with some essence, preserving some tether across time and space. We have a sense of History as an actually existing entity. We see its motive power as "trends and forces" or "great men" or some combination thereof. In the way that, for a pilgrim, a saint represents a closer connection to the divine forces that they believe underlie our world, a historical figure has a closer connection to natural forces that we believe underlie it. One cures a leper, the other cures polio. But assassins are usually the opposite of great men, and the killing is often the only notable thing about them. They represent an unnatural disturbance of history. 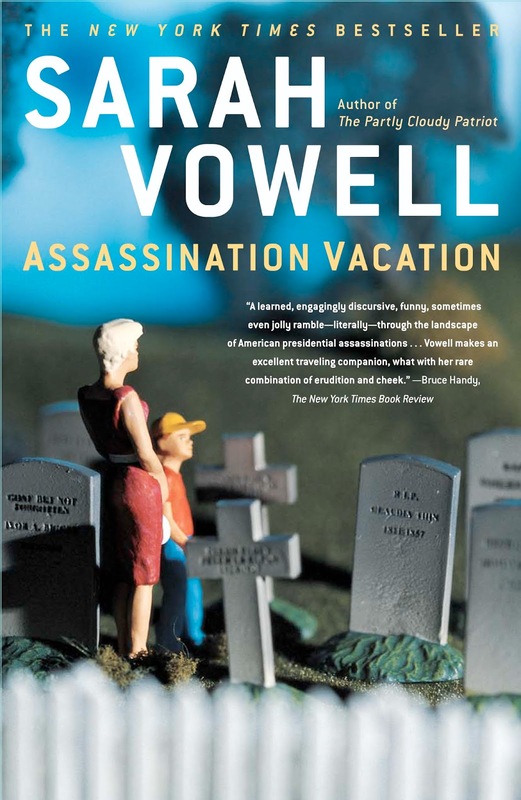 In her book, Vowell describes the assassins as overturning the will of the electorate. The trends and forces that got the person elected and the future actions of a great man are swept aside by one brief and violent action. While our society has a prurient interest in crime and violence, the assassin is of a different class from the rest. We hold Booth and Oswald and James Earl Ray in a different class than Al Capone or Jack the Ripper. Because an assassin doesn't simply kill a person, they impress their will on history itself. Booth didn't just murder Lincoln, he switched the tracks of American history. Of course, who knows how society would be different if Capone hadn't existed, or if one of the Zodiac killer's victims would have gone on to prominence. But while we don't know how Reconstruction would have been different under Lincoln, or whether Robert Kennedy would have won the presidency in 1968, that history would be substantially different if they hadn't been killed is a certainty. For most assassin's changing history is not just an effect of their actions, but the intent. And the fact that someone, often a loser or a lunatic, can so drastically affect the world at large, can overturn the will of the electorate, is frightening, because it shows our beliefs in the logic and comprehensibility of history to be unfounded. Whereas the relics of the great figures connect us to the ebb and flow of history, the assassins' connect us to the chaos, the absurd truth that history is not a river, but countless individual incidents, and that the current we feel is just a post facto generalization, a desire to add order to something that has none. The common explanation for how otherwise reasonable people end up believing in conspiracy theories is straight-forward and easy to empathize with, only having the fault of being completely wrong. According to common wisdom, some people, when faced with a shocking or upsetting act of violence (e.g. the Kennedy assassination, 9/11, any mass shooting), are unable to accept the chaotic violence of the world and buy into a conspiracy theory as a coping mechanism. After all, isn’t it more comforting to pin all the blame on some shadowy organization that we can fight? This is comforting for us non-conspiracy theorists, with the added bonus of being subtly patronizing towards CTs (i.e. conspiracy theorists. I don't feel like typing it a hundred times). This explanation means that, deep down, they realize the same chaos we do, but they’re just really bad at coping, the poor dears. That it doesn’t make sense has been no obstacle to it becoming commonly accepted. The argument that CTs find this conspiracy-haunted world comforting is identical to the claim they make about those of us who don't buy in to their grand conspiracies, that it must be nice to live in a world where individuals are responsible for the bad things they do, and we can trust our institutions, etc. Further, our explanation absolutely fails to address things like, say, 9/11 truthers. 9/11 wasn't a lone wolf assassinating a president or some freak accident. What emotional need is satisfied by shifting the blame from Al-Qaeda to the Illuminati/New World Order/etc.? It's much easier to fight Al-Qaeda than a shadowy secret organization that nobody believes to exist. The answer to how people come to believe in conspiracy theories is pretty simple: The same way as they come to believe in anything else. Let's take the Kurt Cobain murder conspiracies as an example. When a person is faced with new information, that information must be assimilated. If that information fits in with the things you already know, it's a smooth process. (N.B. I'm using the words "know" and "knowledge" to mean statements that one holds to be true, regardless of their factual accuracy.) This is why there aren't as many conspiracy theories about the deaths of Jimi Hendrix or Amy Winehouse. Even their fans know that they both did drugs and that drugs can have tragic consequences. In regards to Cobain, one of the frequent claims made by those who believe he was murdered is that he wasn't suicidal. They know how suicidal people act, and they know that Cobain wasn't acting that way before his death. When this knowledge is contrasted with the knowledge that Cobain died in the way he did, some piece of knowledge must change so the new information can be assimilated. Maybe suicidal people act differently than I thought they did? Alternatively, the new information must be denied. Cobain didn't commit suicide. A more recent theory is that Cobain faked his death, though the prominent theory is the Courtney Love had him killed. But how do we get from "Kurt didn't seem suicidal" to "Courtney Love had Kurt killed?" The steps are pretty easy to trace. If Kurt didn't commit suicide, then he must have been murdered. One of the earliest theorists was a public access host who got footage from a window outside the crime scene and noticed much less blood than he would expect from a shotgun blast to the head. The host, and those who agreed with him, knew how much blood to expect. Also, if one accepts that Cobain was murdered, someone else must have written the suicide note. After all, the note doesn't look right. Which is to say, it doesn't look the way you'd expect it to. And everyone knew Courtney Love was only in it for the money and didn't really care about Kurt. My point here is that conspiracy theories and theorists don't start with a full-fledged master plan. To give one more example, consider the various Shakespeare authorship theories. Typically, people just write them off as snobbery, but the reason is a bit more complex. It also shows that the types of things we "know" aren't always as concrete as in the Cobain conspiracy. The lack of contemporary documentation about Shakespeare isn't unusual, as even many Oxfordians, Baconians, and Marlovians will acknowledge. The real problem is that what we do have shows Shakespeare to be, well, boring and occasionally unpleasant. As James Shapiro shows in Contested Will, it was not Shakespeare's class that dismayed early CTs, but the fact that the few things we know about him show his stinginess (e.g. suing a neighbor over a small debt), and that he retired to his estate in Stratford rather than continue writing in the last six years of his life was unacceptable. Everyone knows that the greatest literature in the English language must have been written by an equally great spirit. Even we who accept Shakespeare of Stratford as the author of his plays feel this disappointment, yet it is a disappointment based on our assumptions about the way the world works. Most of the supporting evidence for these conspiracies are based on accepting certain unproven premises (e.g. the sonnets are autobiographical) which can be construed to prove nearly anything, or by misapprehensions (e.g., there are no records that Shakespeare went to grammar school, therefore he did not. However, there are no grammar school records of any of Shakespeare's peers, some of whom went on to attend Oxford). But the reason there are conspiracies about Shakespeare at all is the belief we have about the personal qualities of a great artist. We can see in the given examples how conspiracy theories arise logically. Logically, if not reasonably. They are logical in the sense that they take a set of given conditions (this is how suicidal people act, this is what a great artist behaves like), and then apply logic. If he didn't kill himself, who wrote the suicide note? If vaccines cause autism, why are doctors saying they don't? If these people standing outside a mass shooting aren't behaving how survivors behave, then who are they? To bring it back to my initial point, what's comforting about believing that your favorite musician's killer is still at large, or that the government is dispersing toxic chemicals from airplane jets? Conspiracy theories, by their nature, have a tendency to broaden their scope. Let's say you start with the knowledge that the US intelligence agencies are close to omniscient and that middle eastern extremist groups are unsophisticated, and then came to the conclusion that 9/11 was an inside job. On the one hand, this would need to implicate a lot of people not directly associated. If you 'know' how a building would appear when it collapses, and countless structural engineers say differently, then they must be lying. On the other hand, this would tie into other conspiracy theories already held. If you believe that there is a Jewish plot to control the world, you'd find a way to tie 9/11 to that. Understanding why people believe in conspiracy theories, and how those beliefs develop is important. I hope it's already understood that most conspiracy theorists are not violent or bigots. But as online communities continue to supplant physical ones, we have to take a few things into consideration. First, groups like Stormfront (the white supremacist forum) have a history of trying to recruit from places like reddit's conspiracy page, not because the groups targeted for recruitment are necessarily racist, but because if (as the neo-nazis believe) there are shadowy Jewish groups controlling everything, why not try to make your case to people who already believe there is a shadowy group pulling the strings? Second, many of the views espoused by conspiracy theorists are socially unacceptable. (In the cases where they accuse innocent people, entire ethnic groups, or survivors of tragedies of unspeakable crimes, I'd say this unpopularity is justified.) Online communities are still communities, and fulfill that need. Communities form identities and protect themselves from perceived threats, even if that means protecting bad behavior within a community. Third, there is still a general feeling that online is not real, not just in terms of community but in terms of actions. As such, harassment of people accused of complicity in a conspiracy has become a serious problem, since there are so rarely any actual consequences for the harassers, even when their activities are clearly illegal. There have always been and will always be conspiracy theories. What needs to be discussed is not how to stop them overall, but how prevent harm to innocent people caught up in them, whether we're talking about the anti-semitic results of "The Protocols of the Elders of Zion," the careers destroyed by McCarthyism, or the harassment of bereaved parents after a school shooting. On the part of conspiracy communities, the answer is better self-policing, primarily in regards to preventing co-opting by hate groups and, as a community, establishing a clear sense of opprobium for harrassment. On the part of broader society, we need to take online actions seriously. Criminal harrassment and death threats must not be consequence free simply because they are carried out online. I finally got around to watching Mr. Holmes on Netflix. 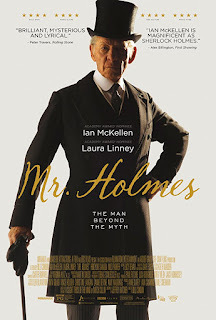 The film, based on Mitch Cullin's 2005 novel A Slight Trick of the Mind, focuses on an elderly Sherlock Holmes struggling to come to terms with senility. Holmes retired from the detective business decades prior to the events of the film, and has decided to write the true account of his last case, the one that drove him from London to a quiet life of beekeeping. Unfortunately, his memory is fading, and he has trouble remembering details, though he is helped along by the housekeeper's precocious son. I've always found Sherlock Holmes fascinating. Not the character, per se, or even the Doyle stories. I have a soft spot for metafiction and the crossover between pop culture and history (cf. my review of Dan Simmons's The Fifth Heart, where Sherlock Holmes teams up with Henry James), so this seemed right up my alley. I was underwhelmed. Without divulging too much, the central mystery of the film (what were the details of Holmes's last case, and why did it cause him to quit for good) doesn't have a satisfactory resolution. The resolution is unambiguous, but unconvincing, for while I can understand Holmes's distress, for a man who is routinely involved with murder and espionage, this isn't nearly enough to justify his response. Meanwhile, Holmes's relationship with the housekeeper's son Roger is touching, but not something that we haven't seen a million times before, even if the acting, from both McKellan as Holmes and Milo Parker as Roger, is above average. As a Sherlock Holmes story, it's uninteresting. As a story about aging and mortality, it's sweet but unoriginal. As a comment on the Sherlock Holmes mythos (of, as the poster says, "the man beyond the myth") it's a real letdown, as it doesn't really add anything except to point out that well-known misconceptions (e.g. the deerstalker) are misconceptions, or to ask "what if Sherlock Holmes were old?" Just thought I'd share a couple photos that I've taken. 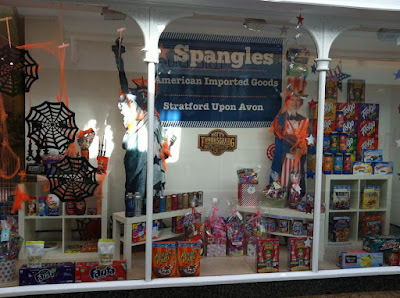 The first is an "American goods" store in Stratford, England. 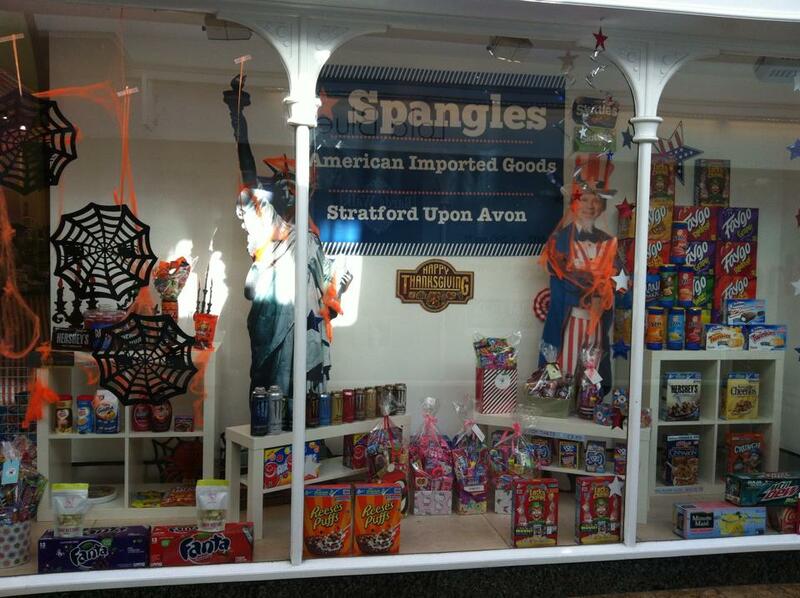 The second is a "British goods" store from Ventura, California. Velcro® makes a music video about why you shouldn't say "velcro"
Intellectual property law is complicated. I can't tell you how many people I've seen spend hours arguing a point about copyright, but who aren't willing to spend the five minutes it takes to learn the basic differences between copyright and trademark. An almost certainly apocryphal rumor holds that there is some employee at Xerox (or Kleenex, or Q-Tips) whose sole function is to search for uses of the brand name as a general term for the product, and send a cease-and-desist letter. This is because, to maintain a trademark, trademarks must be distinct. This is why I can't start a laptop manufacturer called "Laptops" and sue everyone. However, if a term so lapses into general usage, it runs the risk of no longer being distinct enough to be a legal trademark, which leads to often over-zealous protection of trademarks. To this end, Velcro® produced a parody(?) music video admonishing the public to not say "velcro" unless they mean "velcro®." Personally, I take solace in knowing that at some future date a music video of actors pretending to be lawyers singing about IP law may be played in an actual court of law. God bless America.